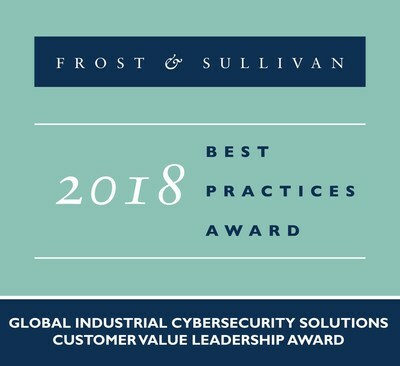 SANTA CLARA, California, Jan. 22, 2019 /PRNewswire/ -- Based on its recent analysis of the global industrial cybersecurity solutions market, Frost & Sullivan recognizes Honeywell International, Inc. with the 2018 Global Customer Value Leadership Award for aiding customers' Industrial Internet of Things (IIoT) transformation by mitigating cybersecurity threats. Its acquisition of the industrial cybersecurity solutions provider Nextnine Ltd. endowed it with access to ICS Shield™, its flagship industrial cybersecurity software solution that has 6000+ installations worldwide. Honeywell has since improved the ICS Shield™ features to make it more suitable for enterprise-wide deployment as a top-down solution for operational technology (OT) infrastructure security management. "Honeywell's enhancement of ICS Shield™ to seamlessly support a multi-vendor OT infrastructure and eliminate cybersecurity threats in numerous physical industrial sites has solidified its leadership in the industrial cybersecurity market," said Mariano Kimbara, Senior Industry Analyst. "Now all industrial customers can uniquely control remote field assets from one security operations center for all industrial sites. The company enriches a customer's purchase experience by doing away with the need for different point solutions for ICS sourced from different vendors." The ICS Shield™ enables companies to discover, connect, and protect assets across their operation environments. The cybersecurity software package includes secure remote access and secure file transfer, automated patch and antivirus updates, asset discovery, performance/health monitoring, vulnerability scanning, and risk analysis, making it a one-stop solution. In addition to functioning as an OT security operations management and monitoring tool, it also supports compliance monitoring and reporting. Honeywell employs a subscription-based model for two of its software offerings, Risk Manager and Secure Media Exchange (SMX), but also has in place an outcome-based subscription contract model. The Assurance 360 Program covers security through CyberVantage™ Managed Security Services, and is driven by key performance indicators such as system uptime, which could be affected by cyber-attacks. These services are available 24x7 as they can remotely manage security tools, perform continuous monitoring and alerting, automate security updates, and provide troubleshooting and support. "As companies continue to digitize their industrial operations and harness Big Data to make informed decisions that enhance productivity, Honeywell's complementary cybersecurity products and services, combined with its significant installed base and deep industry expertise, have positioned it to lead the next era of IIoT transformation," noted Kimbara. Each year, Frost & Sullivan presents this award to the company that has demonstrated excellence in implementing strategies that proactively create value for its customers with a focus on improving the return on investment that customers make in its services or products. The award recognizes the company's unique focus on augmenting the value that its customers receive, beyond simply good customer service, leading to superior customer retention and customer base expansion. Honeywell Process Solutions (www.honeywellprocess.com) is a pioneer in automation control, instrumentation and services for the oil and gas; refining; energy; pulp and paper; industrial power generation; chemicals and petrochemicals; biofuels; life sciences; and metals, minerals and mining industries. It is also a leader in providing software solutions and instrumentation that help manufacturers find value and competitive advantage in through Honeywell Connected Plant, Honeywell's Industrial Internet of Things (IIoT) solution. Process Solutions is part of Honeywell's Performance Materials and Technologies strategic business group, which also includes Honeywell UOP (www.uop.com), a leading international supplier and licensor of process technology, catalysts, adsorbents, equipment, and consulting services to the petroleum refining, petrochemical, and gas processing industries.